The Federal Reserve has been aggressively testing the various monetary tools that will give it additional flexibility during the rate normalization process. In addition to the Term Deposit Facility (see post), the Fed recently started testing the term reverse repo facility (Term RRP - see statement). Note that this is in addition to the Overnight RRP. For those who want to track this program, follow the updates here (see the spike at the end?) The Fed will provide a total of $300bn under the program, with the first such offering completed on Dec-8th. It was a 28-day "secured deposit" paying 10bp (annualized) for $50bn. At the same time the US Treasury has issued a larger than usual amount of treasury bills recently. Since the Term RRP with the Fed is effectively the same as purchasing a treasury bill (particularly at 10bp), the Fed's $300bn program (combined with the existing facilities) effectively "crowded out" the bills market. This ended up pushing short-term treasury yields higher - while yields on longer-dated treasuries kept falling (see chart). 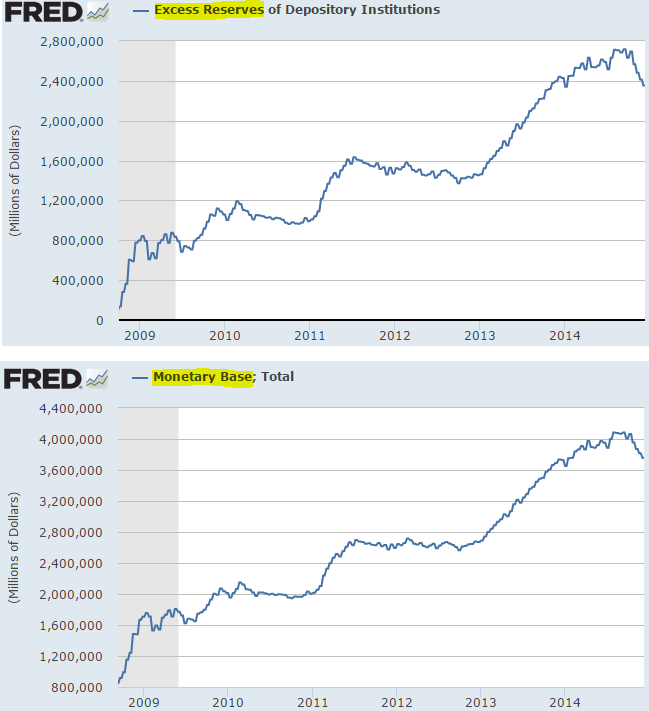 The Fed's latest monetary tools "experimentation" has also drained some reserves and lowered the monetary base. For those who still track the Fed’s total balance sheet, don’t – the balance sheet doesn't tell you much about the monetary stance when you have these new forms of “sterilization”. 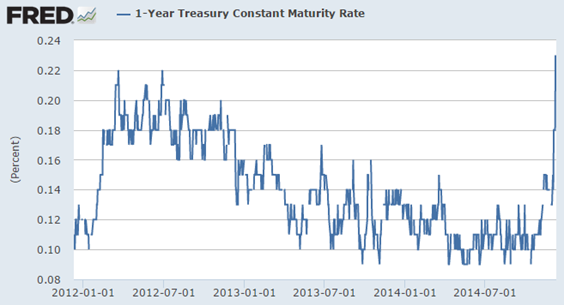 Of course all this is viewed as temporary and the reserves may yet return to their peak levels next year. And judging from current disinflationary pressures (see chart), the actual liftoff - when these tools are going to be implemented on a more permanent basis - may be as long as a year away. For now however these monetary experiments have been sufficiently large to raise short-term interest rates.